Spray Nozzle Engineering introduces a new range of safety air guns designed to reduce noise as well as compressed air usage in industrial facilities. Compressed air usage can be both expensive and dangerous; open pipes are very noisy and waste compressed air due to their lack of directional flow. 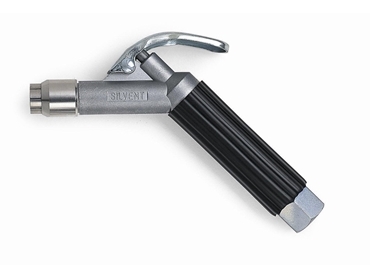 Spray Nozzle Engineering has launched the new SILVENT 755-S safety air gun that reduces noise by 73% and compressed air usage by 49% (Vs open pipe @ 10mm diameter). The 755-S safety air gun is suitable for applications that require a greater concentration of force in the centre of the object to be cleaned, and is recommended for use in heavy industry, mining, power generation, foundries and paper mills among others. Spray Nozzle Engineering’s range of safety air guns and fixed nozzles is used throughout production facilities to improve compressed air safety, reduce compressed air usage and eliminate noise.